A blog post titled “The Real Reason Wheat is Toxic” has been making the rounds on social media. The post by the “healthy home economist” is riddled with errors and misinformation.The post contends that glyphosate is commonly sprayed on wheat at harvest time, and that glyphosate then causes health problems when the wheat is consumed. Shortly after it started circulating, two excellent rebuttals were posted online, one by Sarah Schultz, and another by Jenny Dewey Rohrich. Both Sarah and Jenny do a great job pointing out that spraying glyphosate onto wheat at harvest time is actually a pretty rare practice, done with great care when needed. Most glyphosate used at harvest time is done on spring and durum wheat, and mostly in the northern tier States (North Dakota & Montana) and some Canadian provinces. But about 75% of US wheat acres are winter wheat, and pre-harvest glyphosate application is very uncommon on winter wheat. If you’ve seen the original blog post, I would encourage you to read Jenny & Sarah’s well-researched responses. The figure that the healthy home economist uses in her blog post was originally from a paper by Anthony Samsel & Stephanie Seneff, two people with no formal training in this area. Their paper claims that glyphosate is responsible for just about every disease imaginable. 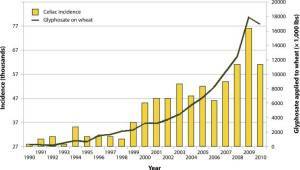 This particular figure shows the incidence of celiac disease diagnoses increasing as a rate proportional to glyphosate use in wheat. I think it is pretty well understood that just because two things are correlated, doesn’t mean there is any cause & effect relationship. The figure below really doesn’t mean anything other than two unrelated things increased at about the same time. But there is one aspect that I haven’t seen explained elsewhere. Why has glyphosate use in winter wheat increased? I checked the NASS database used in the Samsel article back in February, and the glyphosate use data they show does seem to be reasonably accurate. Glyphosate (the active ingredient in Roundup herbicide) can’t be sprayed on the wheat while it is still green, because that would kill the wheat. This fact has lead many to believe that the pre-harvest application of glyphosate must be the reason for the increased use. But glyphosate use for winter wheat harvest is extremely rare. 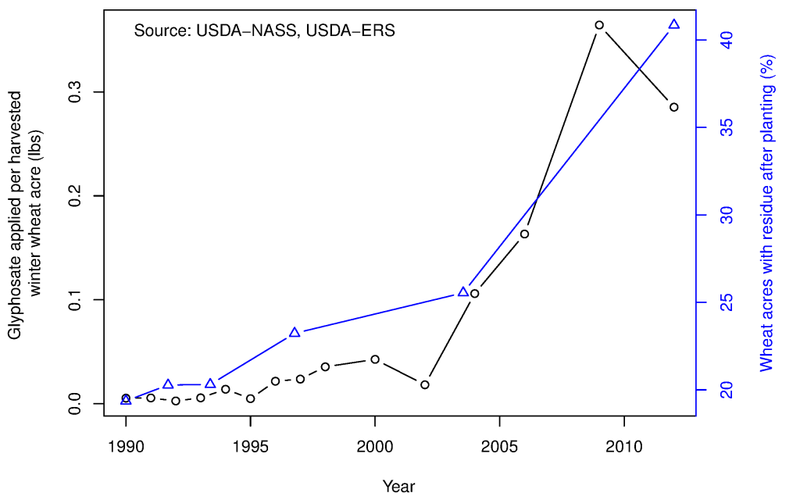 If this is true, how can we explain the increased use of glyphosate in winter wheat? Winter wheat in much of the US Great Plains is grown in strips alternating with idle land (fallow). The next year, the fallow strips will be planted to wheat. So the glyphosate shown in Samsel’s figure could have been applied any time after the last crop was harvested. A large percentage of US wheat is produced in the dry regions of the West. In these dry areas, one of the most common cropping practices is wheat/fallow rotation. There is simply not enough precipitation to produce a crop every year, so the fields are left idle every other year. So for many winter wheat fields in the UDSA survey, the pesticides could have been sprayed any time since the previous wheat crop was harvested; a period that spans up to 15 months in some regions. In the wheat/fallow rotation, weed control during the fallow period is extremely important. If weeds use the water during the fallow period, it will not be available for the subsequent wheat crop and yields will suffer. Historically, tillage was used for weed control in the fallow period between wheat crops. But each time the soil is tilled, moisture is lost. 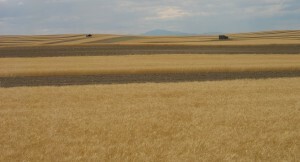 In many rain-fed wheat production regions, reduced tillage systems have been adopted where wheat stubble is left on the field, and the weeds are controlled with herbicides instead of tillage. The most popular herbicide (by a wide margin) in these conservation tillage systems is glyphosate. And it just so happens that the increased use of glyphosate in wheat corresponds quite well with the percentage of wheat acres that had residue present after planting. Glyphosate use in winter wheat, and the percentage of wheat acres that had residue present after planting. The percentage of wheat acres that had residue after planting is probably a pretty good estimate of fields that had no tillage since the previous crop was harvested, because any tillage would bury the previous crop residue. And if tillage was not used prior to wheat planting, it is highly probable that a herbicide was used to control weeds before planting. And glyphosate is probably the most popular herbicide choice in these situations.